We’d love your help. Let us know what’s wrong with this preview of The Prayers of Jesus by Mark Jones. To ask other readers questions about The Prayers of Jesus, please sign up. All true knowledge of God involves mutual loving discourse between God and the redeemed sinner. Love desires knowledge of the person loved. God knows us perfectly, and we must, with all the assistance he affords us, to aim to know him. If this were not supremely important, Christ would not have highlighted this so often in his ministry and in prayer. With knowledge comes affection and with affection comes devotion. As I was reading this devotion on the prayers of Jesus, I came to a better unders All true knowledge of God involves mutual loving discourse between God and the redeemed sinner. Love desires knowledge of the person loved. God knows us perfectly, and we must, with all the assistance he affords us, to aim to know him. If this were not supremely important, Christ would not have highlighted this so often in his ministry and in prayer. With knowledge comes affection and with affection comes devotion. As I was reading this devotion on the prayers of Jesus, I came to a better understanding of why Jesus is the only way to the Father. The bible makes it clear that not one is righteousness and without Jesus we do not have the righteousness to the Father to enter his presence. In knowing God by his word, by prayer and the church, we come to understanding of his holiness and the Glory of God that is for our good. That is the understanding I came with in this devotional. The prayers of Jesus are centered on God's glory and the will of God. Each chapter starts with a verse that Jesus prayed for. A prayer that focuses on our relationship with the Father. Each chapter is filled with supporting scripture and context. The most insightful and filled with contrasting insights between the Garden of Eden and Garden of Gethsemane. What Adam accomplished and what Jesus finished. These contrasting insights give you more of a grasp and understanding that salvation matters. What Jesus did matters for everyone. I highly recommend. Mark Jones keeps delivering solid, Scripture-saturated, experiential theology. Highly recommended! Personally, I didn't get anything out of this book. But that doesn't mean others won't. I received an ARC from NetGalley; all opinions are my own. 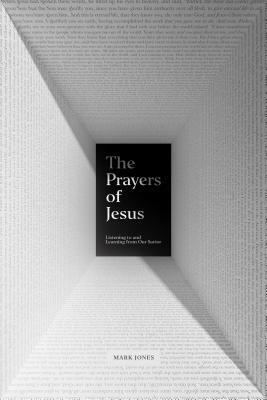 This book studies the prayer life of Jesus through the Lord’s Prayer (briefly) and the High Priestly prayer of John 17. I enjoyed the focus on the trinity’s role in prayer and thinking more deeply about how and why Jesus prayed (not just what He prayed). This isn’t the first book I’d recommend on prayer, but I did find some good takeaways. This book is interesting, but was a little hard for me to follow. There was great depth to the writing which might be hard for some to grasp. But overall I felt like it was a good book.